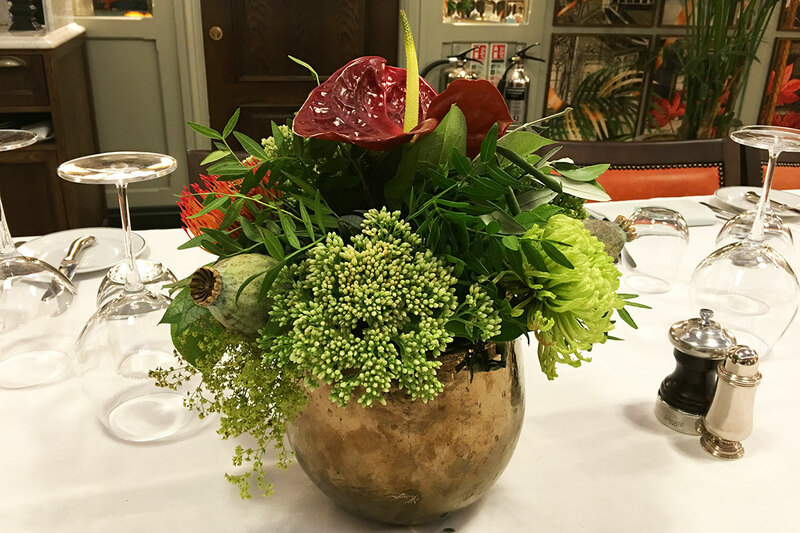 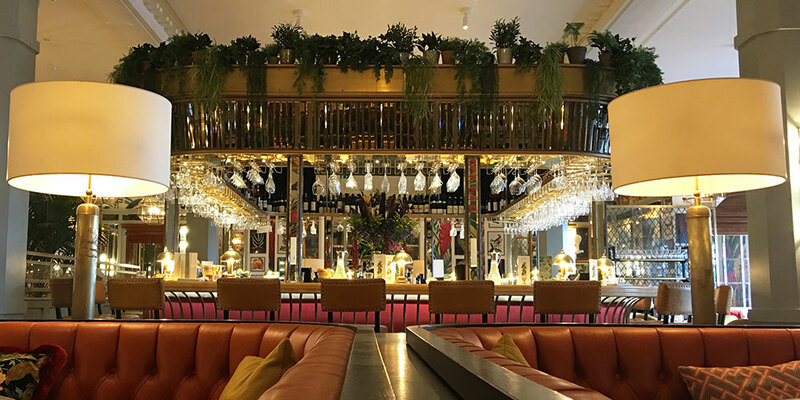 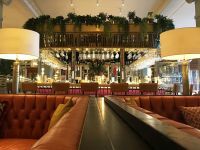 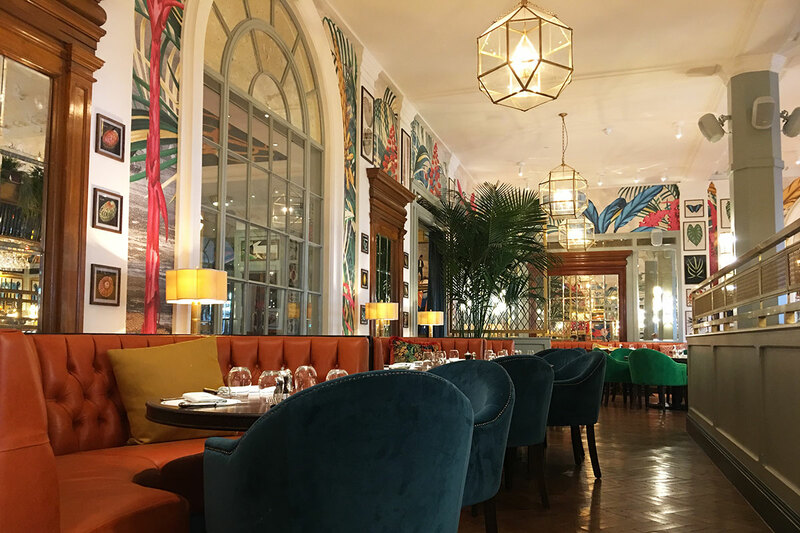 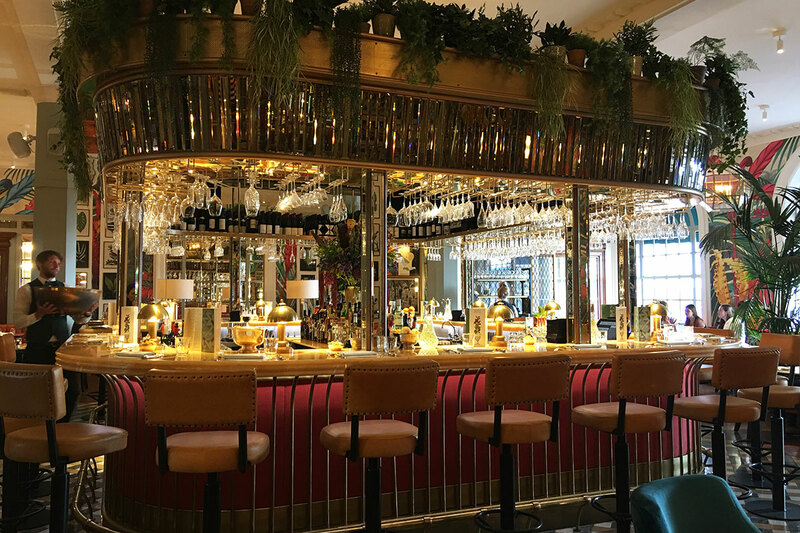 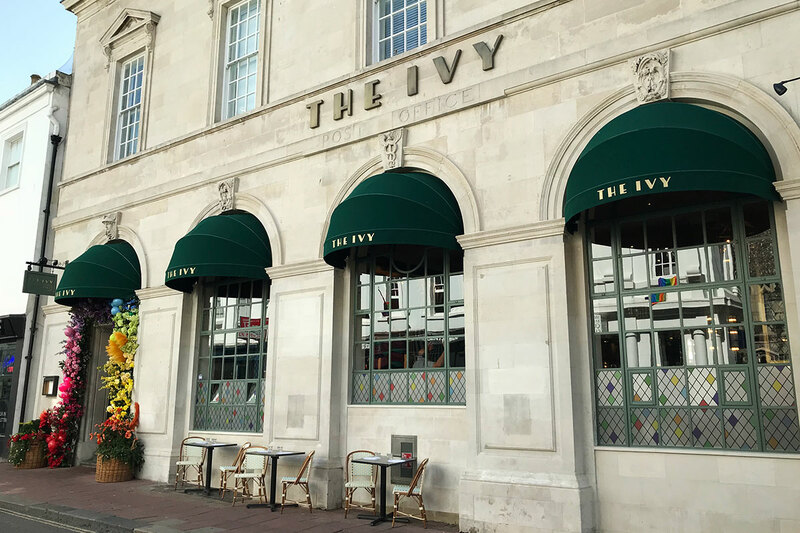 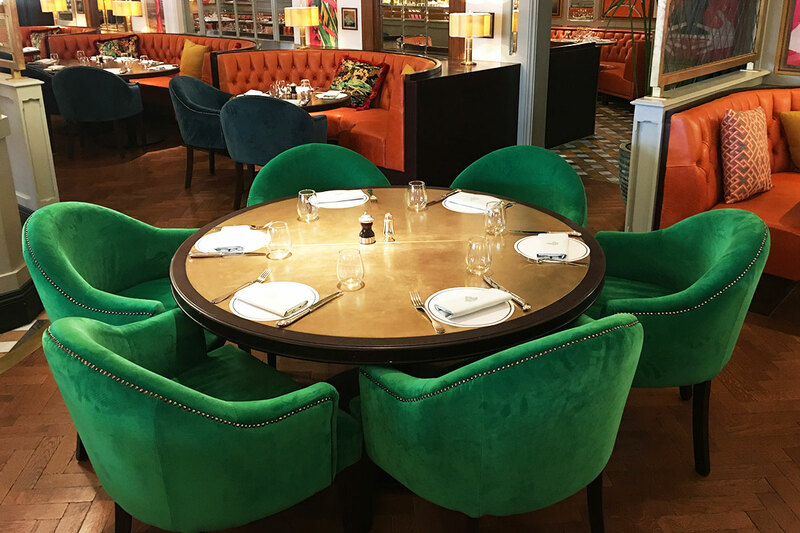 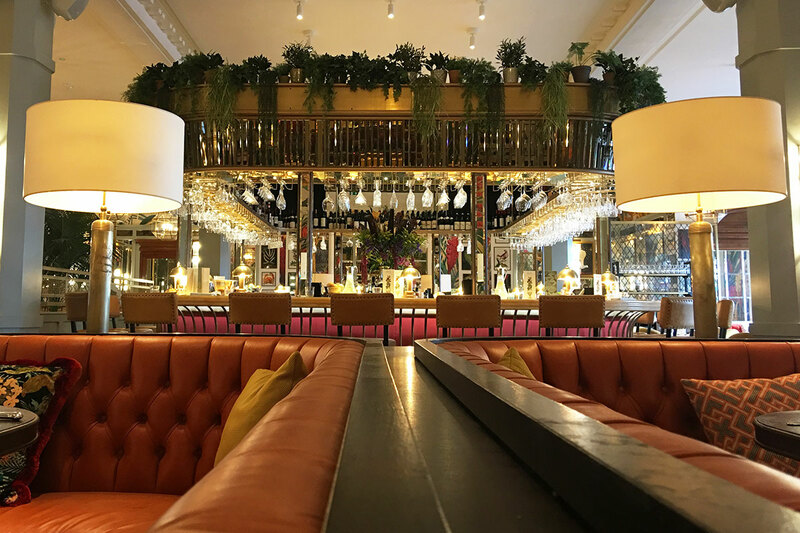 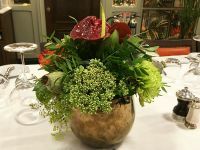 Located in the historic quarter the grade II listed former central post office, The Ivy in the Laines interior is unmistakably classic brasserie with eclectic maximalism and flamboyance. 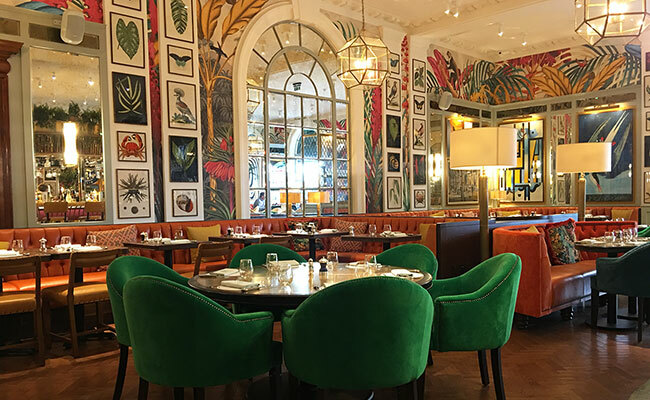 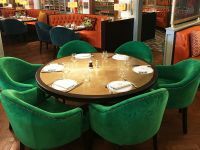 Brighton Ivy restaurant Architects used comfortable leather banquettes and contrasting bright cushions, cut wall mirrors, inlaid marble floor and the tropical foliage of the potted palms to create classic brasserie restaurant. 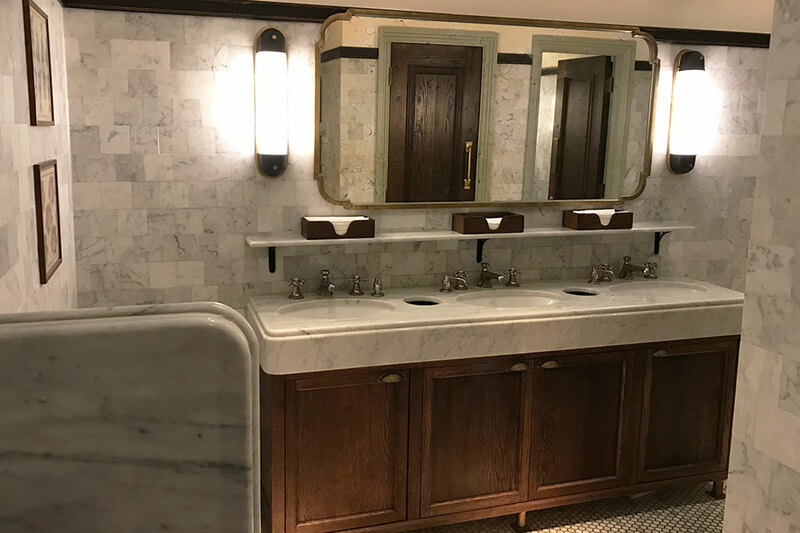 The reception desk is positioned away from the main entrance to allow for queues. 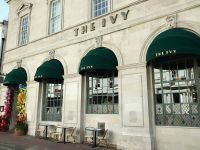 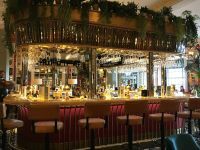 240 cover Brasserie is dominated by the centraly located onyx top bar. 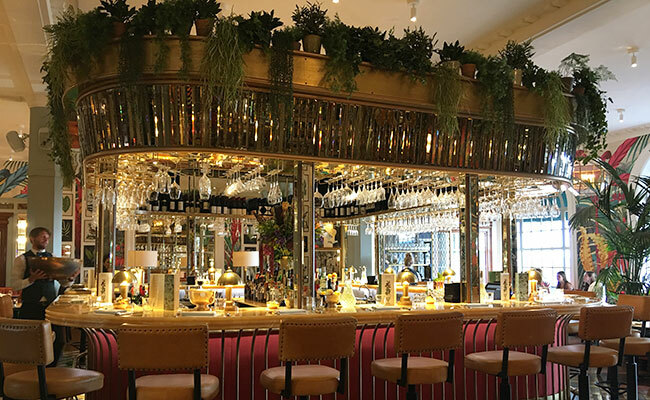 Upholstered bar front and brass railing is crowned with the cut mirrored bar gantry housineg suspended wine stem glasses. 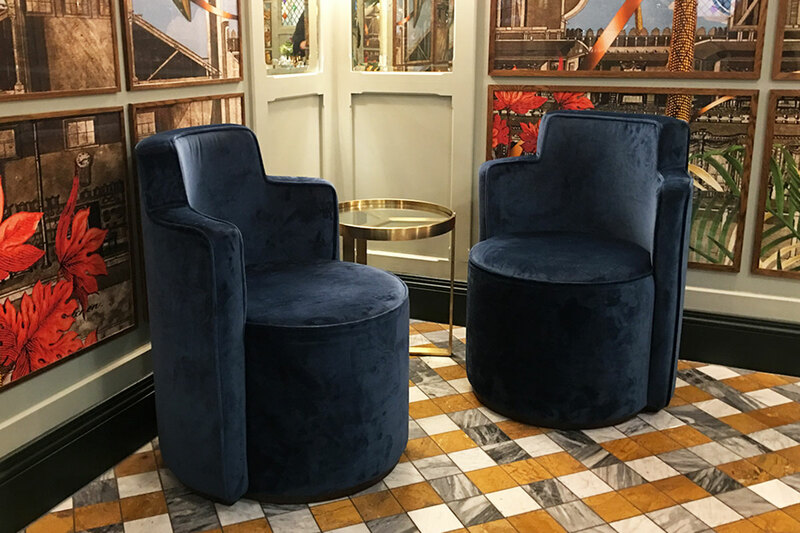 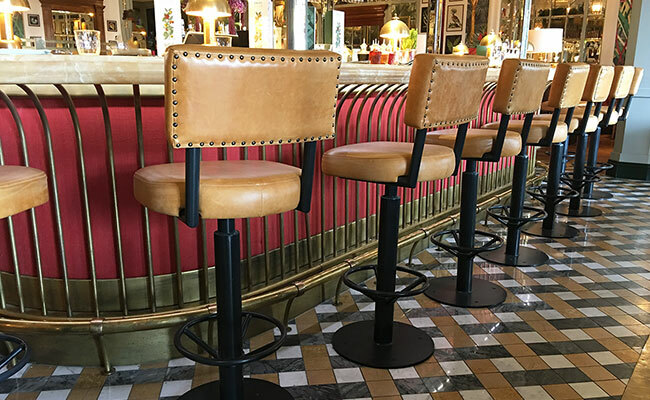 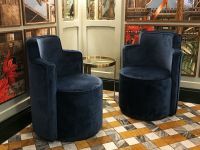 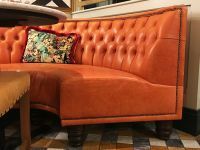 Bespoke mustard leather bar stools which swivel back to position sit proudly on inlaid marble floor. 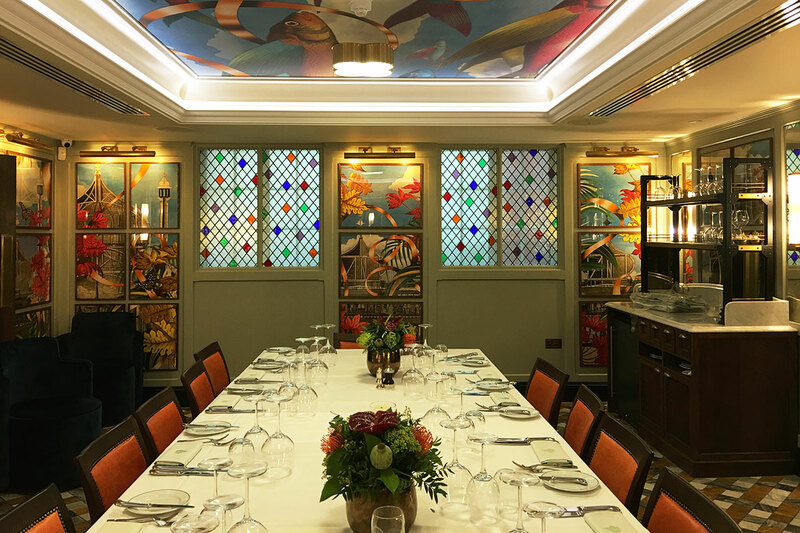 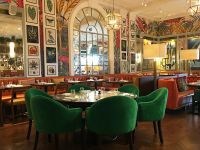 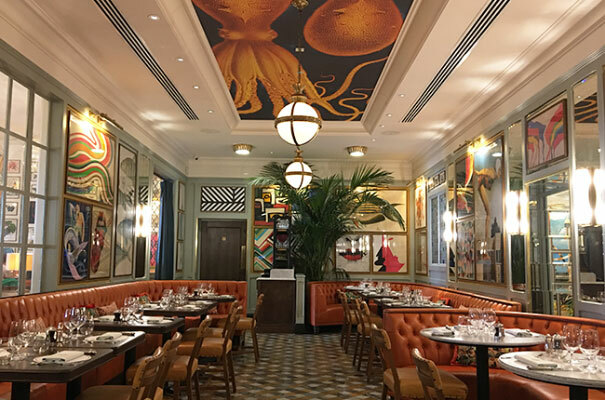 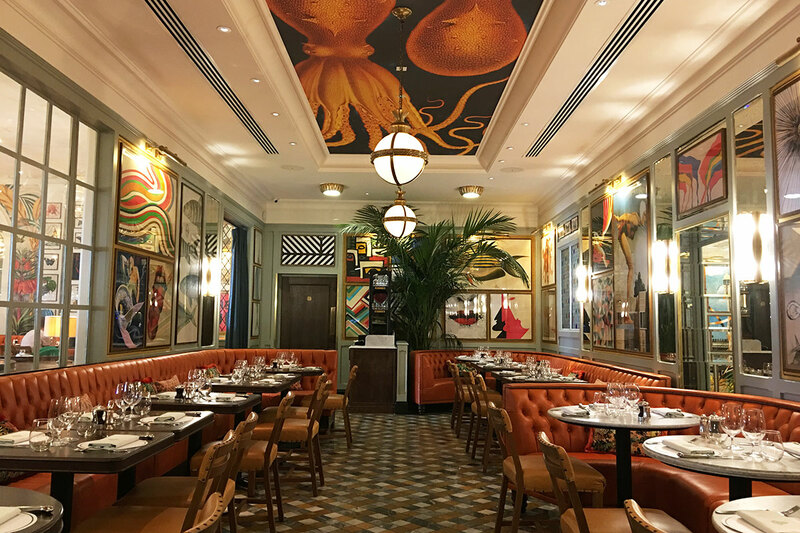 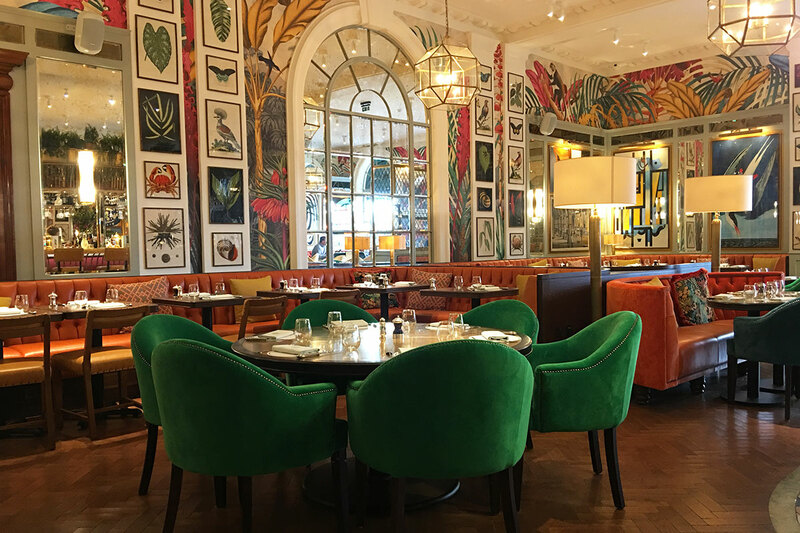 The Ivy Brasserie designers have reimagined the interior through the use of large-scale graphics of locally inspired art and imagery. 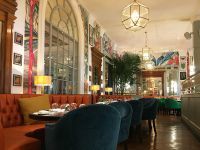 A dining area located further into the building is accessed through wall openings but still very apart of the main restaurant. 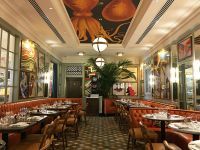 Like the bar apron, this room uses the same marble floor tiles and an oversized octopus mural on the lowered ceiling feature along with vintage style globe pendants making this room enticing even though it is on a smaller scale. 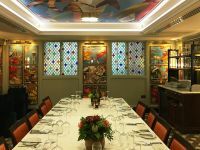 Entry to the prestigious private dining room that holds 12-20 is just off the smaller dining room. 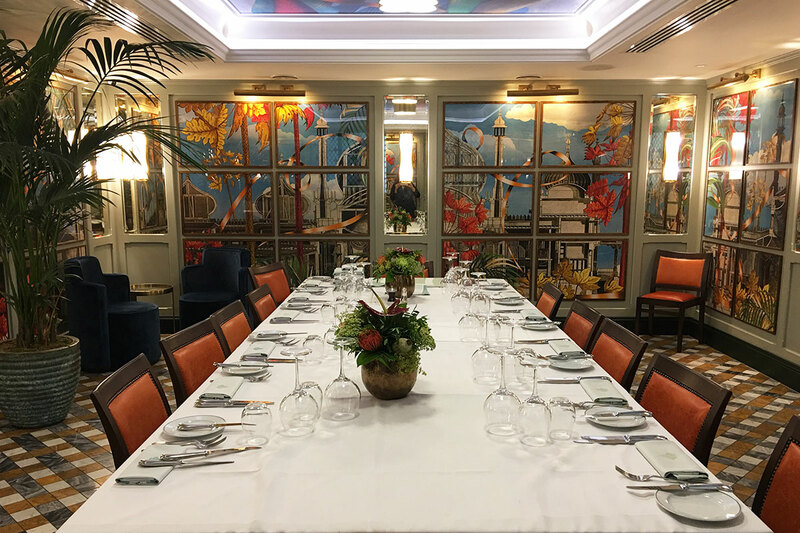 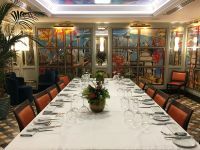 The central banquette table is dressed with tablecloth and flowers , whilst the walls and ceiling have large framed colourful murals of foliage, flying fish and the Royal Brighton Pavilion building architectural illustrations. 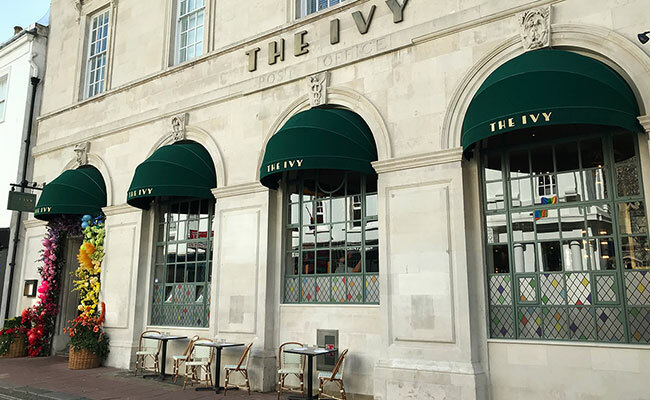 Public areas have been thoroughly thought through by the Ivy restaurant designers, down to the treatment of the walls and flooring. 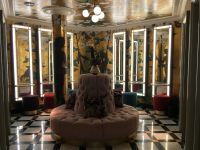 Even narrow stairs leading to the basement have been dressed with the brass handrail and low level concealed lighting picks up the individual steps. 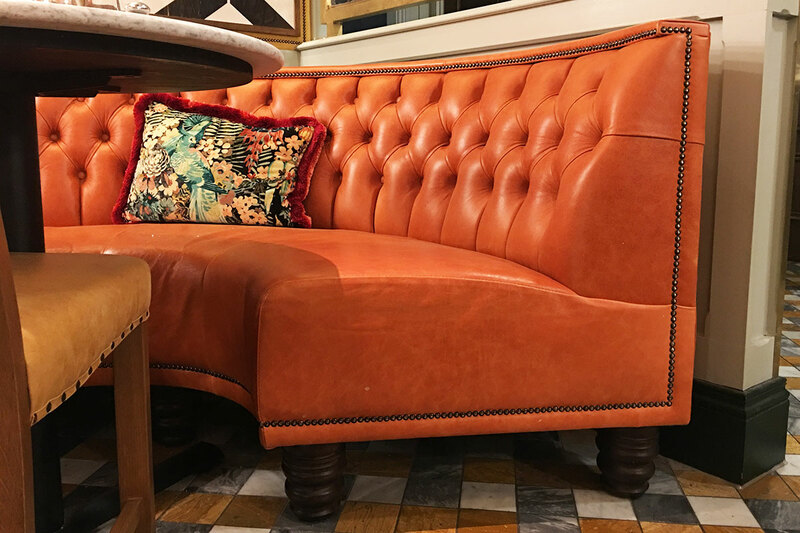 Sunflower coloured fabric panels with studding detail are inset into heritage grey painted wainscot wall panelling. 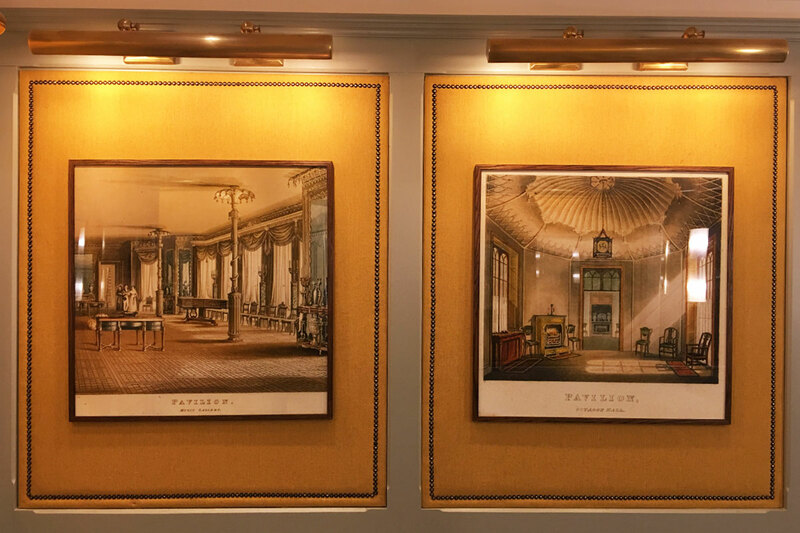 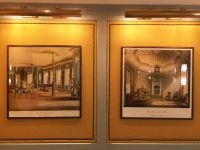 Stairs and corridor walls are lined with the illustrations of the Royal Brighton Pavilion interior. 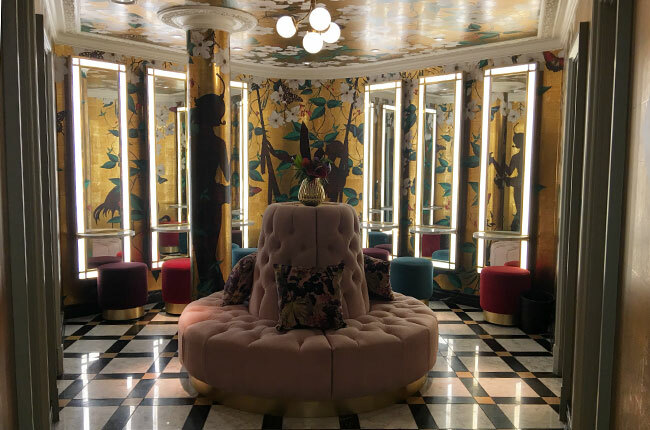 Luxurious wahroom design is achieved with marble and onyx detailing, gold chinoiserie wallpaper that extends over the ceiling. 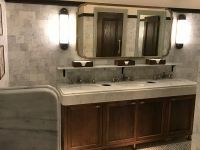 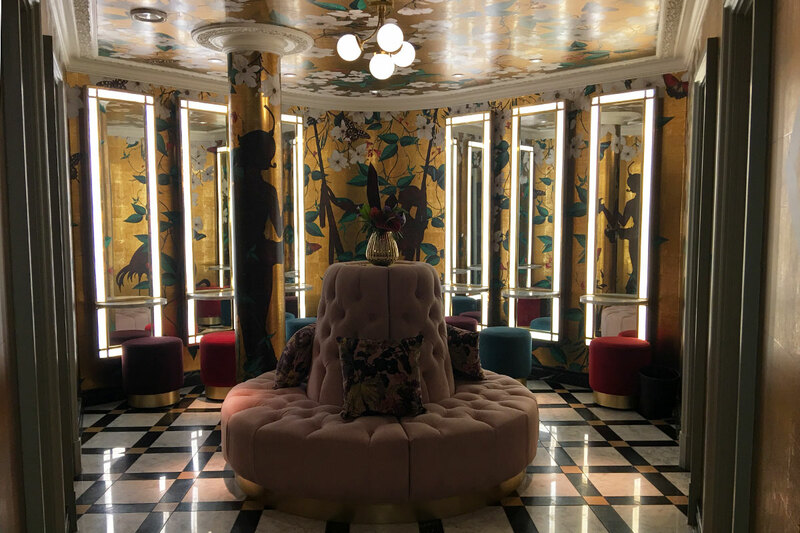 Peter pan character silhouettes, 6 individual beauty stations with full length mirrors and upholstered stools down to the metallic silver butterfly and rose wallpaper inside the cubicles - the ladies washrooms are a pleasantly shocking surprise.